Town defender Frankie Musonda would love to be included in the squad for tomorrow’s FA Cup first round tie with League One Portsmouth. 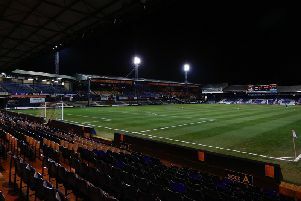 The 19-year-old made his first Hatters start since January in the Checkatrade Trophy clash against AFC Wimbledon on Tuesday night helping Luton to a 2-1 victory. With Johnny Mullins injured and Glen Rea suspended there is every chance one of Musonda or fellow teenage centre half Akin Famewo will be included on the bench for the visit of Pompey, as Musonda said: “Hopefully I can be in the squad, I’ll see what the gaffer decides. “It’s a tough match against Pompey and it should be a good game, as they were a tough side for us last season. Meanwhile, midfielder Andrew Shinnie is also expecting the south coast side to give Luton a taster of the levels they need to attain should they reach League One next season. Speaking after the Dons triumph in midweek, he added: "They will be another good test, another team in the league above, a level we’re hoping to get to next season. “They (AFC Wimbledon) had quite a strong team to be fair and it was quite a young team we had out, so we’ve done really well there.